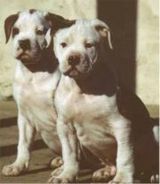 American Bulldogs are powerful, confident, agile, inquisitive and fearless, they can be easily trained to be a gentle and loving family companion. They are alert, friendly and self assured. Early socialisation is the key, ensuring that the American Bulldogs becomes accustomed to family life. They are very energetic and require plenty of exercise. They especially like running, playing catch and long walks. Not much grooming is required, a regular combing is required when shedding. Originally bred to bring down bulls and other livestock, they retain the strength, fearlessness and tenacity in the breed today. It is important to assert your control at a very early stage, especially if there are children in the household. 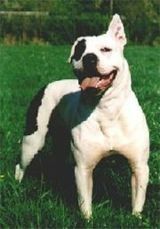 They are loyal and friendly dogs once trained and retain what they have learned for a very long time.